Windows 8 is powered with lots of new features such as, new Windows Start screen, Charms bar and more. 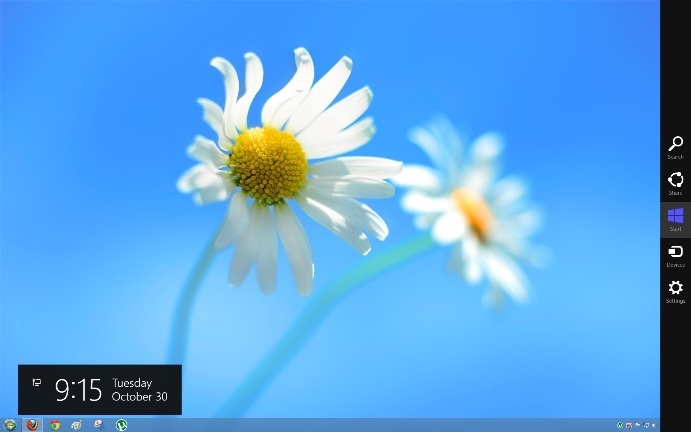 In Windows 8 you can see the new Metro Style Windows Start Screen, also the desktop has charms bar and hot corners. When you move your mouse cursor to the corners of Windows 8 Desktop Screen you can see the charm bar and hot corners. But most of the users don’t like these features on the new desktop and want to remove them from the desktop. Thanks to Skip Metro Suite app, which allows you to Skip Windows 8 Start Screen, Disable Charms Bar, Hot Corners in Windows 8. With the help of the app you can skip the default Windows 8 Start screen easily. It has also the option to disable all Hot Corners on Windows 8 Desktop and Charms Bar. The app is totally free and easy to use, no need to edit the registry keys, just download and install the tool on your Windows 8 PC and you are ready to go. Run the tool on your desktop and you can see lots of the option on your Windows 8 Screen. First Option is Skip Start Screen, it allows you to boot directly to Classic Desktop. Instead of that you have to click on “Desktop” tile every time you logged in. Other Option of the tool is Remove Hot Corners, Which helps you to completely disable all edge panels, not just hide them! All of them will be disabled, including square start button at bottom-left corner. 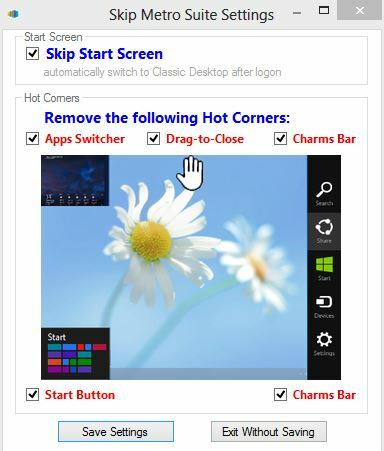 And with the Help of Last option Charms Bar, you can disable all the charms bar of the Windows 8 Desktop Screen. To undo your changes and restore the hot corners in the future, all you have to disable all the option from the app and restart your computer. Or if you want to Quickly Access all these Feature on your desktop press Windows Key+C to open the charms bar or press Windows Key+Tab to open the switcher. Skip Metro Suite does not seem to work on 8pro. No matter how many ‘ticks’, all the corners still work. I’ve tried restarting but no good.